Dorylus male. Photo by A. Buschinger. As expected, it did not take long for this animal to be identified as a male driver ant of the genus Dorylus, commonly known as a sausage fly due to the appearance of the elongate abdomen. African Dorylus species include the largest of all ants: the male in the photo is about 3 cm long while females can be up to 5 cm. Army ants and driver ants are a clade of tropical ants characterised by a number of distinct behavioural and morphological characteristics, including the construction of temporary nests with at least occasional colony migrations to new nest sites and obligatory foraging in large groups. Queens are permanently wingless; both queens and workers are eyeless or possess very rudimentary eyes (the weirdness of army ant eyes was previously referred to in this post) and often exhibit a large variation in size within a colony. Males possess fully-developed eyes and wings and appear so different to the queens that Linnaeus originally described one in 1764 as a species of wasp, and the relationship between males and females was not established until Savage collected them in association in 1849 (earlier authors, noting the common proximity of males to workers, had suggested that the former might be parasitoids of the latter!) During the 1800s, army ants were commonly recognised as a separate family Dorylidae, but since then they have been included in the family Formicidae with all other ants and 'Dorylidae' has not been used as a valid taxon. The former Dorylidae is now referred to as the 'doryline' or 'dorylomorph' group (also including the related subfamily Cerapachyinae, the members of which do not show the full range of army ant characteristics) with the army ants divided between four subfamilies. This subdivision was established when it was thought for a large part of the 1900s that the subfamilies might be convergent rather than related, but in recent years both morphological and molecular studies have supported a single origin for the army ant lifestyle (Brady, 2003; Brady & Ward, 2005). Within the army ant clade, the basal division has been consistently identified as between the South American Ecitoninae and an Old World (African and Asian) clade including the genera Dorylus, Aenictus and Aenictogiton*, each currently placed in a separate monogeneric subfamily. The biology of army ants was reviewed by Gotwald (1982); I've drawn heavily on that publication for this post. *Aenictogiton is a rather enigmatic genus, known only from the rarely collected males. Whether the species of this genus exhibit army ant lifestyles, as suggested by its apparent phylogenetic position, requires the identification of females to establish. Workers of the South American ecitonine Labidus praedator, showing the huge variation in size between large and small workers. Photo by Alex Wild. Army ants can be roughly divided between species that forage above ground (epigaeic forms) and those that forage subterraneously or beneath leaf litter (hypogaeic forms), though some hypogaeic species will forage epigaeically if conditions permit (usually at night). Similarly, epigaeic foragers may in turn be either epigaeic or hypogaeic nesters. For obvious reasons, the epigaeic species are the best studied with little being known about the sociobiology of most hypogaeic species; however, it is the hypogaeic forms that account for the majority of army ant species. 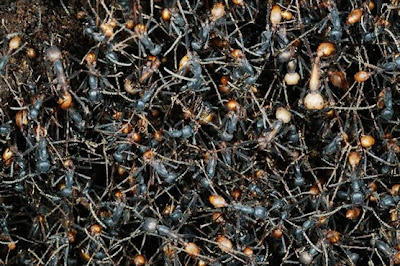 In all army ants studied to date, foraging is done by advancing columns or networks of groups of workers, without individual exploratory scouts searching ahead for food sources. Location of food sources is therefore largely fortuitous, though advancing columns are attracted to movement (potential prey animals have been observed avoiding predation by the simple expedient of not moving). In the subterranean forager Dorylus laevigatus, smaller workers produce small exploratory tunnels, often by muscling into pre-existing cracks in the ground; once a suitable food source is discovered, the tunnels are enlarged to allow the passage of larger workers (Berghoff et al., 2002). Digging is done by workers wither carrying away soil pieces or passing them beneath their body to on-following workers (Berghoff et al., 2003). In epigaeic forms, all sizes of worker participate equally in exploration, though the largest of workers (often referred to as 'soldiers'; however, different worker sizes exist as points on a spectrum rather than as discrete classes) usually only perform defensive rather than food-gathering roles for the simple reason that their hypertrophied mandibles (which increase allometrically with body size) are largely incapable of handling food items. Smaller workers will also handle smaller food particles or may transport liquid rather than solid food sources. Most food items are small animals such as earthworms or arthropods though some species will also take plant foods such as oily fruits; despite the somewhat macabre stories sometimes told about army ants, larger animals are rarely at risk unless injury or confinement restricts their ability to move away from the foraging column. 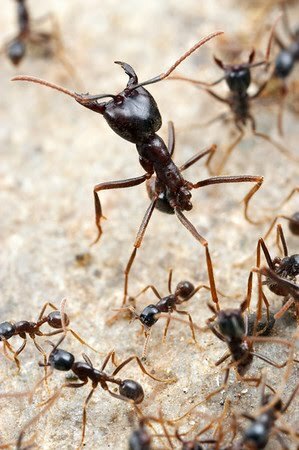 Army ants have functional stings that most use in addition to their mandibles for attacking prey or other animals disturbing the column; however, Dorylus species appear to use their mandibles only. Many African tribes have supposedly exploited the aggressiveness of driver ant soldiers for suturing cuts; the ant was held to the open wound and its head broken off after its mandibles had clamped into the patient's skin. 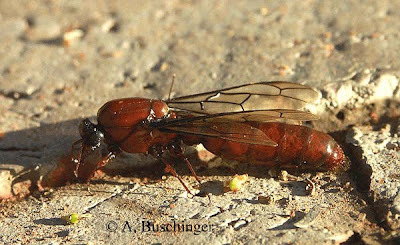 Queen of Eciton burchelli during the reproductive phase. When the colony becomes nomadic, her expanded abdomen will shrink down and she will become difficult to distinguish from a large worker. Photo from Arkive. In many species, a regular transition occurs between nomadic and stationary phases in the life cycle; in others, the transition is more irregular and less defined. In those species with separate phases, the queen of a colony lays eggs during the stationary phase, her abdomen becoming massively swollen while laying. 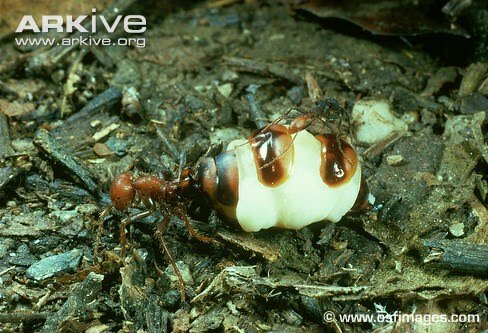 An army ant queen may produce hundreds of thousands of eggs over the course of a year (which will of course include a number of nomadic phases in those species that have them); the queen of Dorylus wilverthi has been estimated to produce from 3 to 4 million eggs per month. When the young reach the larval stage, the ants become nomadic and the queen's abdomen telescopes down in size so that she is able to move along with the rest of the colony (Dorylus queens, which do not have such clearly separated life phases, do not undergo this regular expansion and contraction). When the larvae moult into pupae, the colony returns to the stationary phase and produces a new nest. 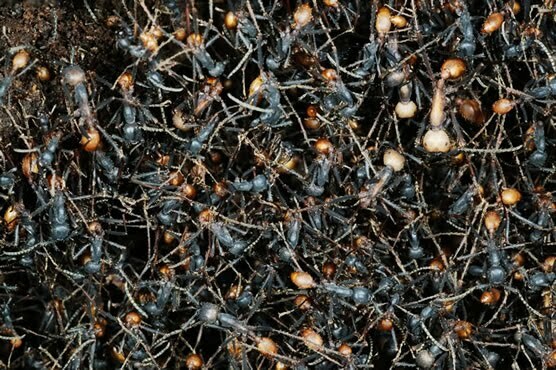 Hypogaeic nesters dig a nest into the ground; epigaeic nesters produce a bivouac between plant branches by means of larger workers linking themselves together into a living net with the queen safely held in the centre. Bivouac of the South American Eciton burchelli. Photo from here. Because army ant queens do not possess wings at any point in their lives, they do not perform dispersive nuptial flights in the way of many other ants. The winged males do still function to disperse genes between colonies; mature males leave their parent colony to find a suitable mate, dying after a period of a few days to a few weeks. New colonies are formed by colonial fission; if a brood contains developing queens, some workers in the colony become attached to the new queens instead of the old. Usually only the first one or two young queens to emerge from the pupa establish new colonies; once they reach maturity, they will leave their parent colony, taking those workers that have transferred their allegiances with them. The workers are unable to survive long without a queen, but if a colony should happen to lose its matriarch all may not be lost for the individual workers. If they should find another colony before they perish, they may be adopted into that colony and transfer their loyalty to a new queen. 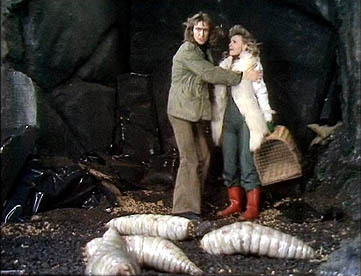 Of course, if they are carrying any larvae or eggs produced by their old queen, those will soon be consumed by the new colony. Berghoff, S. M., J. Gadau, T. Winter, K. E. Linsenmair & U. Maschwitz. 2003. Sociobiology of hypogaeic army ants: characterization of two sympatric Dorylus species on Borneo and their colony conflicts. Insectes Sociaux 50 (2): 139-147. Berghoff, S. M., A. Weissflog, K. E. Linsenmair, R. Hashim & U. Maschwitz. 2002. 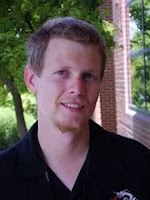 Foraging of a hypogaeic army ant: a long neglected majority. Insectes Sociaux 49 (2): 133-141. Brady, S. G. 2003. Evolution of the army ant syndrome: The origin and long-term evolutionary stasis of a complex of behavioral and reproductive adaptations. Proceedings of the National Academy of Sciences 100 (11): 6575-6579. Brady, S. G., & P. S. Ward. 2005. Morphological phylogeny of army ants and other dorylomorphs (Hymenoptera: Formicidae). Systematic Entomology 30: 593-618. Gotwald, W. H., Jr. 1982. Army ants. In: Hermann, H. R. (ed) Social Insects, vol. 4 pp. 157–254. Academic Press: New York.